BlogHome » Blog » Glossary » What is a tambour door? 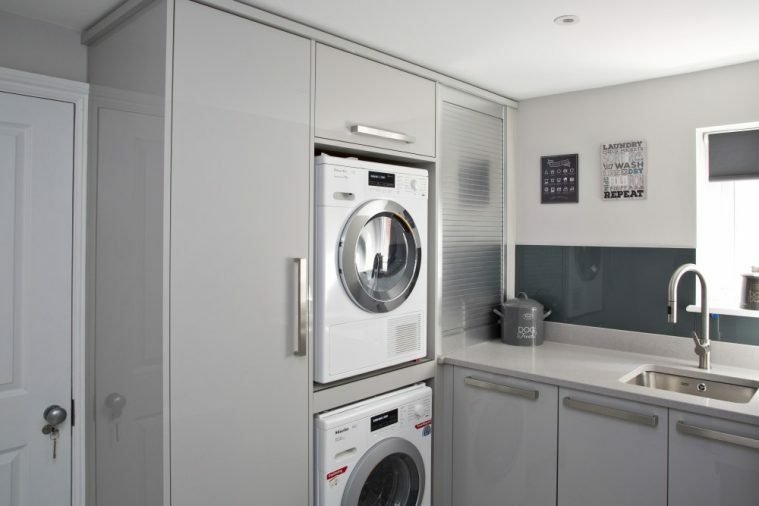 In this article we’re taking a look at what tambour doors are and how they can be used in your perfect kitchen or utility room design. A tambour door is a sliding door made of slats which roll up as the door is opened upwards or sideways. Where does the word ‘tambour’ come from? The word ‘tambour’ originates from French, meaning a small drum (hence ‘tambourine’ – a small drum with jingling metal discs around the sides). It has come to be used for a number of different things, including a frame for keeping fabric taut for embroidery, a circular wall, a sloping projection into a real tennis court and a lobby enclosed by sliding doors (typically in a church porch). It is likely that’s it’s this final use of the word, the lobby enclosed by sliding doors, which led to the term being applied to sliding doors within furniture. Tambour doors can open vertically (up and down) or horizontally (side to side). The horizontal, or side opening, versions can also open around bends, which can be a very useful solution to a problematic corner! How are tambour doors constructed? 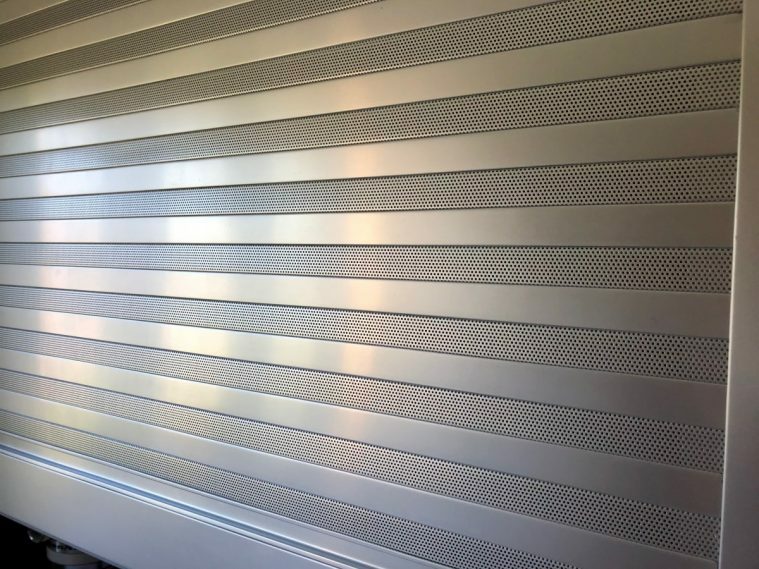 While traditionally made from metal, tambour doors can also be produced in wood veneer, glass or polymers, providing plenty of design options to blend in with the rest of your kitchen. The doors are constructed from slats which fit into guiding tracks at either end (the tracks can be curved to go around corners). At the top or side (depending on which way the door opens) is a spiralling device, which rolls the door up as it’s opened. 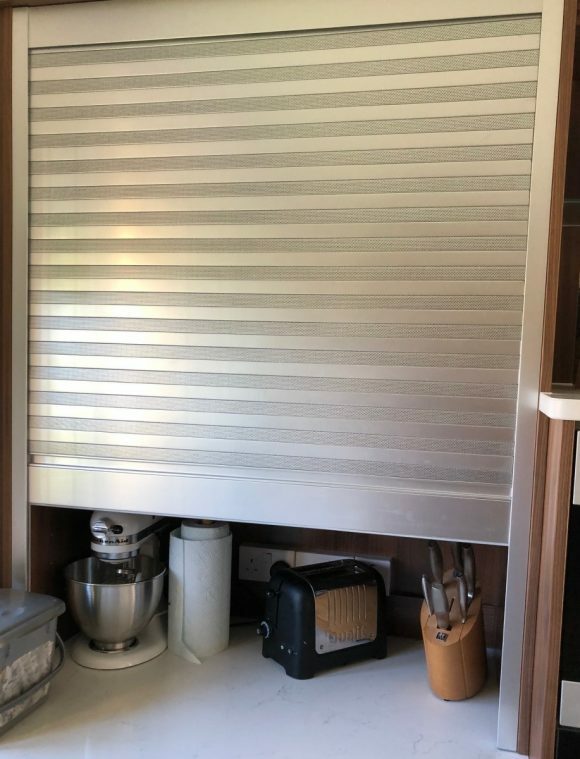 The tracks can be fitted to the edges of a cabinet and, if preferred, can be concealed behind an overhang. Homeowners usually opt for tambour doors because they are fantastic for saving space as you don’t have to allow for the door swinging open. They’re also becoming an increasingly popular choice from a design point of view, particularly for those who like a contemporary, industrial style. Although they can work just as well with a more traditional look. And it’s not just in the kitchen that they can be a great choice; home offices, utility rooms and bedrooms can also use tambour doors to their space-saving advantage. Find out how we used a tambour door to maximise space in the Powell family’s home renovation in Sidcup.